G3YNH info: Components and Materials: Part 1. 2. Components and Materials: Part 1. 1. Resistance, resistors and conductors. 2a. AC resistance of thick wires. 3. Traditional approximations for Rac. 3a. AC Resistance factor. The analytical separability of resistance and reactance that underpins AC circuit analysis can lead to the impression that, were it not for the limitations of the materials at our disposal, it might be possible to create perfect passive components. This, as it transpires, is not the case; for reasons that are embedded in electromagnetic theory, and that can ultimately be traced to the principle of causality . It can be shown that, if the relationship between resistance and reactance is assumed to be arbitrary, then it it is implied that there are networks that can see into the future (i.e., systems that give an output before receiving an input). It is not possible to build such circuits, and the consequence is that there are constraints on the impedances that can be exhibited by any given device. Thus the bad news is that there are no ideal resistors, capacitors, and inductors; the best we can do is to optimise a component for one of the three attributes and try to minimise the others. The good news however, is that we can still analyse most circuits as though they are made up of hypothetical pure resistances and reactances; i.e., it is legitimate to draw equivalent circuits for our imperfect components and so produce theoretical models that describe practical networks to a high degree of accuracy. In some instances, a simple analysis based on the idea that electronic components are ideal is sufficient; but such an approach is often inadequate at radio frequencies. It is therefore important that we develop at least a qualitative, and preferably a quantitative, understanding of the properties of practical electrical components (and that includes wires, circuit-board tracks, and insulators); and so we return to basics and look once again at the subjects of resistance, capacitance, and inductance. Forgive us for stating the obvious; but resistance is an attribute of objects that conduct electricity, whereas a resistor is an electrically conductive device designed to exhibit a particular value of resistance over a reasonable range of temperatures, voltages, and frequencies. Thus 'resistor' and 'resistance' are quite different concepts, and it is important to be sure of the distinction. Resistance is a dynamic manifestation of the ability to consume power or perform work (both being equivalent from a circuit analysis point-of-view), and there can be no resistance when there is nothing to resist. Consequently, in the absence of an applied voltage, resistance exists only notionally as a predictor of the corresponding current when a particular voltage is applied. If a voltage is applied to a resistance, an electric field must exist in the vicinity of that resistance (electric field-strength is measured in volts per metre). If an electric field exists, energy must be stored in that field or as a result of the forces produced by that field. Therefore resistance cannot exist independently of capacitance. If a voltage is applied to a resistance, a current flows, i.e., a magnetic field is formed, and energy is stored in that field or as a result of the forces due to that field. Therefore resistance cannot exist independently of inductance. Since resistance cannot exist independently of inductance and capacitance, the impedance presented by any resistor or conductor carrying an electrical current will always vary with frequency. It transpires that the real part of that impedance, the effective resistance, will also vary with frequency; for reasons associated with the way in which resistance and reactance interact. If a very pure (i.e., frequency-independent) resistance is required (e.g., for a dummy-load resistor), about the best we can do is construct a low-value resistor as part of a transmission-line; i.e., place it in a metal tube with dimensions calculated to give a particular characteristic impedance, like a coaxial cable. A transmission-line is a device in which the distributed inductance of the conductors is balanced by the distributed capacitance between the conductors at all frequencies, provided that the line has no losses and is terminated by a particular value of resistance. Unfortunately, transmission-lines do have losses, and there will be some difficulty in determining where the transmission line ends and the resistor begins; which means that there will always be a small residual reactance. Thus, whatever we do, pure resistance always eludes us, and although the frequency dependence can be minimised, it can never quite be made to go away. 63 mm). Provides an almost purely resistive termination at frequencies up to 1 GHz. In any electrical system, energy is transported by the electromagnetic field. Hence the electric 'current' used in calculating power is associated with the magnetomotive force, and is identical to the magnetomotive force in the event that each loop of magnetic flux encirles the current only once (i.e., presuming that the conductors are not coiled). The magnetic field however sets charges (e.g.., free electrons in wires) in motion, and so there is a current (sometimes called convection current) within conductors, and this current is proportional to the strength of the magnetic field. The fields due to the conduction current and the incident electromagnetic energy interact (i.e., are superposed) in such a way as to cause energy to follow the outside surfaces of conductors. Thus electrical energy is guided by wires, but remains largely external to them. Because electrons undergo collisions with the atoms of the materials in which they move, the conduction process is not perfectly efficient. The energy transferred by collisions is lost from the field and converted into heat. Thus we pay a price for the facility to guide energy from place to place, in that conductors offer resistance to the flow of current. The resistive loss is proportional to the current density, i.e., to the conduction current per unit area at some point in a plane perpendicular to the direction of flow. Hence losses can be reduced by increasing the available area; but (as we shall see in the next section) it turns out that, except at very low frequencies, increasing the effective area for conduction is not the same as increasing the cross-sectional area of the conductor. The resistance of ordinary conductors, although often considered to be negligible, increases drastically with frequency. This is due to a phenomenon known as the skin effect; which arises because the conduction current at the surface of a conductor prevents the associated magnetic field from penetrating into the body of the conductor. Since a current always has a magnetic field associated with it; the result is that the current becomes more and more concentrated at the surface as the frequency is increased -. From a radio engineering point of view, the major consequence of the skin effect is that the high-frequency resistance of wires and other low-resistance conductors is much greater than the DC resistance. This phenomenon is the principal cause of energy loss in transmission lines, antenna wires and coils, and must therefore be taken into account when maximising the efficiency of RF power-transmission equipment. The variation of resistance with frequency for a conductor is a function of its conductivity and its magnetic permeability, both of which will be defined in the discussion to follow. If length is measured in metres, and area is measured in metres-squared, then resistivity must be measured in Ohm-metres (Ωm) in order for the right-hand side of this equation to have overall dimensions of Ohms (Ohm metres × metres / metres² = Ohms). In some reference books however, resistivities are given in Ωcm. To convert a quantity in Ωcm to Ωm, divide it by 100. The table below shows the resistivities of some common materials in nano-Ohm-metres, i.e., Ωm×10-9. (Sources: CRC Handbook , see also Kaye & Laby online  & Wikipedia. Solder resistivity from manufacturer's data sheet). (2) Used for glass-to-metal seals in borosilicate glass. 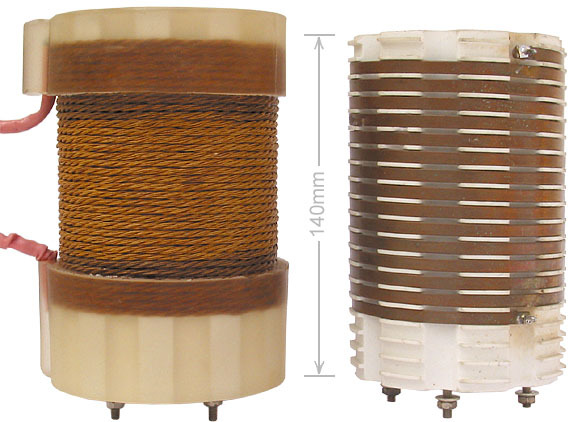 (3) The international standard Ohm was once defined as the resistance of a column of pure mercury with a cross-sectional area of 1 mm² (i.e., 10-6 m²) and a length 1.063 m, maintained at 0°C. Using ρl/A=1, this gives ρ=10-6/1.063 = 940.734 nΩm @ 0°C. The modern definition of the Ohm is based on the von Klitzing resistance RvK, determined from the Quantum Hall Effect . RvK = 25812.8056 Ω.
ρ = 17.241 × (1 - 5×0.00393) = 17.241 × 0.98035 = 16.90 nΩm. Evidently, copper would not be much good for making resistors even if it had a higher resistivity, because its resistance changes by 2% for a mere 5° change in temperature. In general, resistivities calculated using temperature coefficients are less accurate than the resistivity at the measurement temperature T0; and resistivity data should always be sought for a temperature close to the required temperature (see ref , section 1.8.1). Note that the temperature coefficient is always positive for true conductors, but is negative for semiconductors; i.e., as the temperature is increased, conductors increase in resistance, and semiconductors reduce in resistance. >>>> Insert passage on inferred absolute zero method. Since resistivity has units of Ohm-metres, conductivity has units of 'per Ohm metre'. The unit 'per Ohm' (Ω-1) however, is known in old textbooks and papers as the 'Mho' (Ohm spelt backwards), and in contemporary documents as the 'Siemens' (symbol capital S, as opposed to the second, which has a small s). Thus the preferred unit of conductivity is the 'Siemens per metre' (S/m). The dimensionless susceptibility in the cgs system must therefore be multiplied by 4π to make it consistent with the SI definition. AC measurement of magnetic susceptibility is also possible and is used for the characterisation of non-conducting materials and superconductors . Materials can be classified into three principal types according to their magnetic susceptibilities; these are: diamagnetic, paramagnetic, and ferromagnetic. Diamagnetic materials are less permeable than free space, and therefore experience a small repulsive force when introduced to the field between the poles of a magnet. Typical diamagnetic susceptibilities are in the order of -10-5; and so diamagnetism decreases the permeability of a material in comparison to free space by about 0.001%, and can therefore be ignored when estimating RF resistance. Paramagnetic materials are more permeable than free space and so are attracted into magnetic fields; but the effect is once again small, typical paramagnetic susceptibility being in the order of +10-3, i.e., paramagnetism increases the permeability by about 0.1% in comparison to free space and can also be ignored. Ferromagnetism however, is a special case of paramagnetism, it being associated with extremely large magnetic susceptibilities; more than one million for some special magnetic alloys. The relative permeability of ferromagnetic materials varies with the magnetic field strength, and such materials will always show some residual magnetisation when the magnetising force is removed. Ferromagnetism also disappears above a certain temperature, known as the Curie point, which depends on the material (the Curie point for iron is 770°C). One obvious test for ferromagnetism is to see if the material can be picked-up with a permanent magnet. The table below shows the susceptibilities and permeabilities of the common wire-making and wire-plating materials . The permeabilities of the ferromagnetic materials are necessarily approximate, the appropriate figure for the present purpose being the initial permeability, i.e., the permeability associated with low values of magnetic field strength. *Grey tin, the preferred crystalline form below 13°C, is also known as 'tin pest' (a degenerative disease of electronic equipment built using some types of unleaded solder). The table below shows skin-depth values in microns (i.e., micro-metres, μm) calculated using this method (0.001" =1mil= 25.4μm) (1mm=1000μm). The surprise is perhaps that the current-carrying layer is extremely thin even at low radio frequencies; the skin-depth in copper (for example) being only 48 μm (0.048 mm) at 1.9 MHz. Notice also that the ferromagnetism of iron has a devastating effect on the skin-depth, even though iron is a material of relatively low conductivity. A recent recommendation in a British Amateur-Radio magazine, that plastic-covered iron wire sold in Garden Centres can be used to make aerials, does not seem so sensible in light of these calculations. It will seem even less sensible when we estimate the actual resistance per unit length of some typical wires. 2-2a. AC resistance of thick wires. where Aeff is the effective conductor area, which is a function of the skin-depth δi and the shape of the conductor cross section. Resistance (in Ohms) of a 1 m length of 1.5 mm diameter wire. We do not of course, normally encounter wires made of solid silver, zinc, or tin. These are instead the common plating materials. Typically, a silver-plated copper wire will have a plating thickness of 1-10 μm, a tin-plated copper wire will have a plating thickness of about 0.8-3 μm, and a heavy-zinc plated (hot-dip galvanised) iron fencing-wire about 50-125 μm [data culled from various wire manufacturer's websites]. Once the skin-depth becomes substantially less than the plating thickness, practically all of the radio-frequency current flows in the plating, and the resistivity of the base-wire becomes irrelevant . Notice also that for radio-frequency purposes, a tubular conductor is just as good as a solid wire, and may offer a considerable saving in weight and cost when a large diameter is required. The data in the table above indicate that silver-plated copper wire or tubing is the best commonly available conductor for radio applications, with plain copper (bare or enamel coated) coming a close second. Tin-plated copper (ordinary hook-up wire) is somewhat inferior, and although the current will tend to penetrate into the underlying metal even at UHF, considerable current density will still occur in the high-resistivity outer layer. An interesting corollary here is that solder (60/40 tin-lead alloy) has a higher resistivity than plain white-tin, and so when soldered joints are made, care should be taken to minimise the spread of the solder. This is not a serious issue when making wire connections, but it does mean that the RF signal tracks of printed circuit boards should be left as plain copper as far as possible, a layer of protective lacquer being preferable to solder-coating. Having praised silver however, we should state that there is some controversy over the matter of whether or not the silver plating of copper conductors is worthwhile , especially since the reduction in surface resistivity is only about 7.8%. The issue here is that silver plating definitely reduces RF resistance initially; but if the silver is allowed to tarnish, the RF resistance will eventually exceed that which can be achieved using plain-copper that has been subjected to the same environmental conditions. We can understand what is happening here by noting that both silver and copper will grow a surface layer on exposure to the atmosphere. In the case of copper this will be composed of copper oxides (and will include a mixture of copper hydroxide and carbonate if the wire goes green), whereas in the case of silver; the surface layer is composed mainly of silver sulphide. If the tarnish layer is moderately conductive, either throughout, or in the partially-formed boundary layer between it and the metal, some of the conduction current will flow in the tarnish layer, and this process will be lossy. Consequently, we can deduce that if the Q of silver resonators (for example) degrades faster than the Q of copper resonators (which it does), then either silver sulphide is a much poorer insulator than copper oxide, or the partially-conductive boundary between the metal and the non-conductive tarnish coat is thicker in silver than it is in copper. The former appears to be the case, since the resistivity of AgS is around 1.5 - 2.0 Ωm, whereas for CuO it is 6 kΩm and for Cu2O it is 10 - 50 Ωm  (Ag2S is light-sensitive and so cannot be expected to persist). The conclusion in any case is that silver plating is only worthwhile if the silver is sealed away from environmental contamination and sources of sulphur (such as vulcanised rubber). We should note also, that enamel-coated copper will not tarnish at all, and so should maintain its initial performance indefinitely; and the increase in losses for not using silver can often be offset simply by increasing the wire diameter. For truly dire performance however, soft-iron garden-wire is in a class of its own (although galvanised-iron fencing wire is not too bad, except that it will eventually rust). A 10 m long transmission-line made from plain iron wire (1.5 mm diameter) would have a loss-resistance in the region of 140 Ω at 14 MHz. The only saving grace, is that the author of the recommendation that it can be used to make antennas will be hampered in passing-on his ideas via radio. Condemnation aside however, this does raise an interesting issue; which is that VHF mobile radio installations often use stainless-steel whip antennas, and the question arises as to whether or not this is a good idea. The antenna is a so-called 5/8-wavelength vertical. A proper description is that it is a shortened 3/4-wavelength (0.75λ) ground-plane antenna. The input impedance of a vertical antenna changes cyclically as the length is increased, crossing the resistance axis (i.e., X→0) with alternating low and high input resistance every time the length reaches a whole number of electrical quarter-wavelengths (electrical length is always slightly longer than physical length, due to a reduction in the apparent speed of light for waves travelling in the vicinity of conductors). A perfect vertical antenna mounted on a perfect ground plane has an input resistance of about 36.6 Ω when its electrical length is 0.25λ, and about 45 Ω when its electrical length is 0.75λ (the painted mild-steel roof of a car is not a perfect ground plane, but it is a lot better than soil). The effect of shortening a 0.75λ vertical antenna slightly is to increase its input resistance and make the input impedance capacitively reactive. To make the antenna suitable for connection to a 50 Ω coaxial cable therefore, it is shortened slightly to raise its input resistance, and a loading coil is added to cancel the resulting reactance. The length of the antenna is thus chosen so that the radiation resistance, plus the loss resistances of the antenna hardware and the loading coil, add up to 50 Ω.
and so, despite the unprepossessing resistivity of the rod material, the choice is harmless in this case. Indeed, the resistance of the rod is beneficial, because it provides the antenna with a small amount of resistive loading (in addition to that due to the roof of the car), and so reduces the Q and helps to make the antenna usable without adjustment over a band of several MHz. Where, for non-ferromagnetic materials, μr can be assumed to be 1. An important point to bear in mind regarding these simple approximations for AC resistance is that they are not very accurate. They can be used for the purpose of rough estimation, but they should never be incorporated into the code of general-purpose computer programs. Accurate calculation methods are given in [Zint.pdf]. Hence for an isolated 1mm diameter copper wire operating at 1 MHz, equation (3.4) tells us that the AC resistance is roughly 3.8 times the DC resistance. Accurate calculation of the AC resistance factor is discussed in [Zint.pdf]. For direct currents, the resistance of a conductor is inversely proportional to its cross sectional area; but at high frequencies, due to the skin effect, its resistance is inversely proportional to its perimeter. The perimeter of a circle is, of course, the circumference (which is equal to π×d), and so the RF resistance of a cylindrical conductor decreases as the diameter is increased. It should be noted however, that a circle is the shape that gives the shortest perimeter for a given area; and so the RF resistance of conductors can be reduced by deviating from a circular cross-section. This observation results in the use of flat copper (or silver-plated copper) strip for conductors and coils in high-power high-frequency RF applications , and in the use of bunch-wire and litzendraht (woven-wire) at lower frequencies (10 kHz - 3 MHz). Bunch-wire is made simply by taking several strands of insulated (usually enamelled) wire and twisting them together. The wires are kept electrically separate, and are not stripped of insulation and soldered together until they reach their terminations. The idealised cross-section for a bunch of seven wires is shown in the illustration right. Notice that the overall diameter D in this case is three times the diameter of of the wires used, i.e., the wire diameter is D/3. The circumference of each wire is therefore πD/3, and since there are seven strands, the total perimeter is 7πD/3 (assuming that the insulation is very thin). Thus, by using seven strands we increase the perimeter by a factor of very nearly 7/3 (2.33) compared to a solid cylindrical wire of the same overall diameter. From the above argument, we might be tempted to assume that a seven-strand bunch will have an RF resistance that is 3/7 of that of a comparable single wire, but unfortunately, this is not the case. Such a topology does reduce the effective resistance significantly at very low radio-frequencies, but its usefulness fades as the frequency is increased. The reason can be seen by first considering the points at which the wires lie in contact with each-other. Here, for a particular wire, the field associated with the current in the adjacent wire will be strong; and at some fairly low frequency, by the same process as that which gives rise to the skin-effect, these regions will cease to carry significant current. Once current has been repelled from these regions, the wire surfaces facing into the six voids inside the bundle will be screened from the outside world, and current will only flow on the outward-facing surfaces. At this point, the central conductor carries virtually no current and serves no purpose except to maintain the shape of the bundle. As the frequency is increased further, current will not even venture into the valleys between the conductors, at which point the RF resistance will be much the same as that obtained by using a single wire of the same overall diameter. It is for this reason that, although bunch-wire is used for coils and interconnections in switched-mode power converters (tens of kHz), it is not much used in HF radio applications. Litzendraht or "Litz wire" gives an improvement in high-frequency performance in comparison to bunch-wire because it is woven in such a way that, in a given length, every conductor has an equal chance of appearing in the outside layer of the bundle (i.e., it is braided or plaited). In this way, no conductor is completely buried, and every conductor is forced to carry current. The use of litz wire is generally beneficial between about 50 kHz and 3 MHz , but offers only marginal advantage at the higher end of this range (i.e., on the 160m band). Litz wire, incidentally, is also sometimes used in audio systems. It serves no useful electrical purpose at audio frequencies, because the skin depth is greater than the radius of all reasonably-sized wires, and its bulk (DC) conductivity is less than that of solid or multi-strand wire of the same overall diameter. It is much more expensive than ordinary wire however, and in Hi-Fi circles that alone appears to be sufficient reason for using it. Although skin-effect calculations are useful for estimating the resistance of isolated conductors, they usually fail at predicting the RF resistance, and hence the Q ,of coils (Q=XL/R). The cause of this discrepancy might be suspected from the arguments given in the previous sections, i.e. : just as the current flowing on the surface of a conductor disrupts the current flowing in the body of the conductor, the current in any given conductor interferes with the currents flowing in adjacent conductors. This phenomenon is known as the proximity effect. Due to the extreme complexity of the fields associated with RF inductors, there are no simple theoretically-based formulae for calculating the proximity effect in arbitrarily constructed coils. For many problems however, all that is wanted is a relatively straightforward way of optimising the length, diameter, wire-size, and wire-spacing of coils for use in matching networks and radio-signal circuits. This is an issue that has concerned engineers since the earliest days of radio; and those past endeavours have resulted in a number of standard empirical (i.e., experimentally obtained) formulae that we can use to calculate inductance and Q from coil geometry, to an accuracy of a few % (see refs , and [Medhurst 1947]). We will leave detailed discussion of inductors until chapter 3, but it is appropriate to have some idea of the magnitude of the proximity effect in the present context. Although the RF resistance of coils is governed by diverse processes, one matter on which we can rely is that the losses in a coil will always increase with frequency. This simple fact has a remarkable consequence; which is that, since the reactance of an inductor (XL=2πfL) increases with frequency, and the RF resistance increases with frequency, the Q of the coil (being the reactance divided by the RF resistance) varies relatively slowly as the frequency is changed. Practical experience then has it that reasonably well-optimised air-cored coils operated well away from energy-absorbing materials have Q's in the range of 100-400. The AC resistance of this length of straight copper wire at 14 MHz, using the thick conductor approximation (3.2), is 0.27 Ω. Thus the proximity effect, in this case, has increased the RF resistance of the wire by nearly four times. This figure should certainly not be taken as representative of all coils; the effect will be greater if the turns are more closely spaced and vice versa. It brings us to the point however, that the design of coils is a compromise between close-spacing of turns, which increases inductance by increasing magnetic coupling between the turns but exacerbates the proximity effect, and wide-spacing of turns, which minimises proximity effect but increases RF resistance by requiring a greater length of wire for a given inductance. Ψ varies between 1 and 5.8 depending on the length / diameter and winding-pitch / wire-diameter ratios of the coil. It does vary slightly with frequency, but by no more than a few % once δi/d has become less than 0.1.